Double pin cradle hitch : SARL Maxima, Specialists in the sale and reparation of machines and accessories for the construction industry. Importer and distributor of both hydraulic and pneumatic equipment. The Double Pin Cradle Earth Drill hitch can be supplied in both loose and fixed pin versions to suit standard and quick hitch solutions on most excavators & backhoes. This hitch is suitable for all our drives from the Earth Drill X1500 to the Earth Drill 50,000MAX. The use of a Cradle hitch is recommended by Auger Torque as it will eliminate Auger swing during dirt shake off, will enable you to safely transport your Earth Drill and Auger on site and will also help you in lining up your holes with precision. No mechanical parts or dampers mean that even if your Earth Drill and hitch have a tough life ahead of them you will not have to worry about costly replacements or breakdowns. 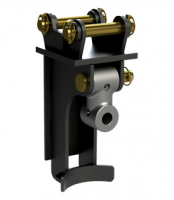 Just like all Auger Torque products only the highest grade steel is used in the fabrication of this style hitch. When ordering this hitch please supply your pin diameter, dipper width and distance between pin centres.